February 24, 2018 By This post may contain affiliate links. 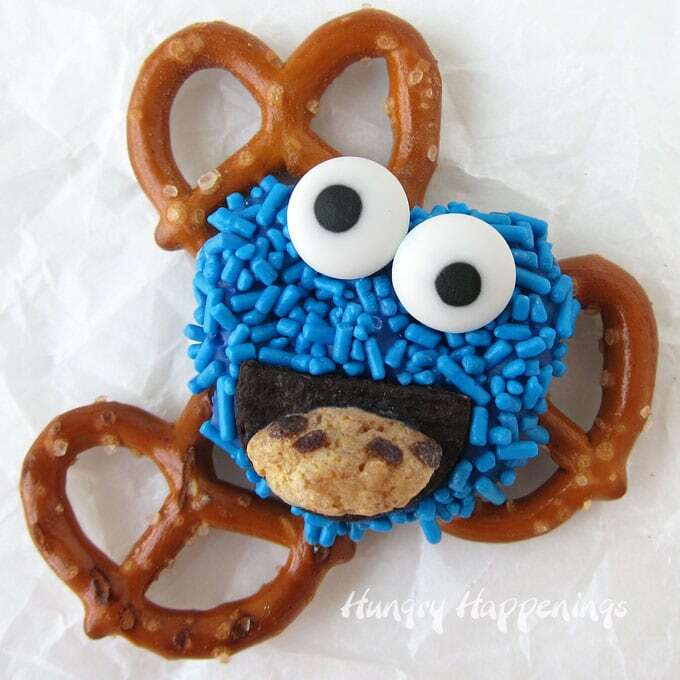 Elmo Pretzels make cute Sesame Street party food. Each mini pretzel twist coated in red candy melts and red sprinkles is decorated with a big chocolate cookie mouth, an orange candy nose, and cute candy eyes. Elmo is one of the sweetest of all the Sesame Street Characters and he just got even sweeter! I grew up long before Elmo hit the scene over on Sesame Street but I still remember the first time I saw this lovable Muppet and heard his voice. Back in 1996 I was busy running my candy store, didn’t have kids, and didn’t watch much T.V., but I kept hearing about this Tickle Me Elmo doll that everyone was trying to get their hands on for Christmas. I didn’t know who or what Elmo was at the time, so I had to turn on PBS to find out. I was immediately enamored with the baby-talking, red-fur-covered-monster who had won the hearts of toddlers all over America. He was so likable and irresistibly cute. When I decided to create some of the Muppets from Sesame Street out of pretzels, I started by making Cookie Monster Pretzels and knew I had to make Elmo Pretzels too. What do you think? Are these Elmo Pretzels as sweet as Elmo is himself? I think so! They are easy to make too. 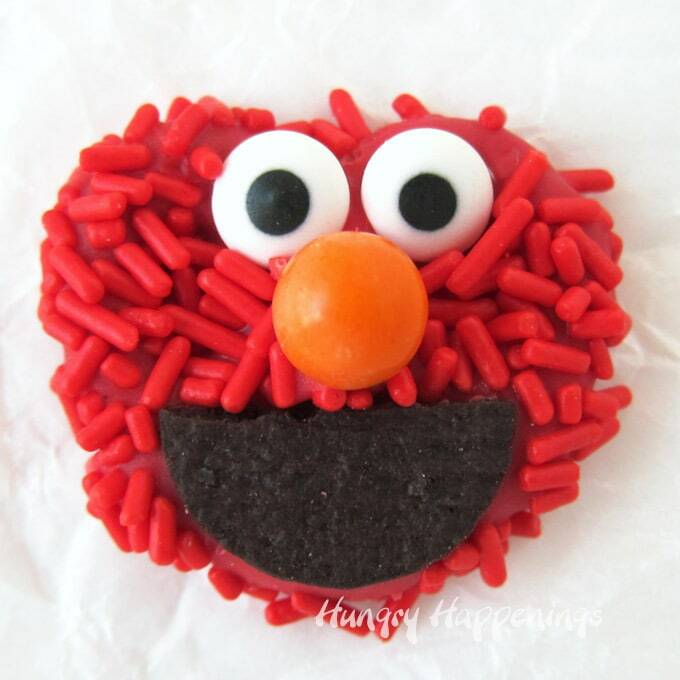 Just dip a pretzel in red candy melts, attach a cookie mouth, a candy nose, two candy eyes, then cover the whole thing in red jimmies (sprinkles) and you have Elmo. You can find detailed instructions for working with candy melts on my Chocolate Making Tips page. You can find the supplies to make these Elmo Pretzels on amazon (commission earned for sales). 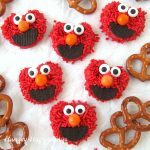 Mini pretzel twists dipped in red candy melts sprinkled with red jimmies are decorated to look like Elmo. Divide each Mini Oreo Cookie in half. Use a sharp knife to cut each chocolate cookie into two half moon shaped mouths. Dip one mini pretzel twist in red candy melts using a dipping tool or fork. Attach an orange Sixlet just above the mouth to create Elmo's nose. Add two candy eyes along the top edge of the pretzel twist. Sprinkle red jimmies over top and allow to dry for 10 minutes. Repeat coating and decorating all 36 of your pretzels. After the pretzels have dried pick them up and allow the excess sprinkles to fall off. Have fun making these Elmo Pretzels. If you make them and share them online be sure to link back to this blog post, mention Hungry Happenings, and use #hungryhappenings. I know it’s amazing to think Elmo has been a part of the Sesame Street family for that long. I know he’ll be a part of kids lives for a very long time to come. BETH , AGAIN YOU NEVER CEASE TO AMAZE ME AND IM SURE MANY OTHERS , YOU ROCK !!! Elmo is so Cute! I did a Elmo birthday party for my little girl when she was 2. Now she has a son and he loves Elmo. I guess Elmo will never get old. I wish I could do these in Tom and Jerry. My daughter is have a Tom and Jerry Party for my grandson and something like this would be too cute! I agree, Elmo will be popular for a very long time. He’s just so darn cute. Tom and Jerry would be a bit more challenging to make out of pretzels but I think it definitely could be done. If you give it a try I’d love to see pictures.